Final Team: With a few hours until kick off this is the final team I’ve decided to go for. Should this change before kick off this evening, I’ll be sure to post an update. I can’t see this happening unless there are any last minute injuries. Foster (West Brom – 2.5m) – its took a long time but I’ve eventually done a U turn on having Pickford. The 0.5m difference between keepers has helped significantly in improving my defence. It’s taken me from a few half decent options at 3m (non in Europe) to a lot of good options at 3.5m. Foster also has good fixtures to start at West Brom. Although I still think Pickford will score higher, the point difference between keepers is usually fairly minimal due to them historically scoring lower. Valencia (Man Utd – 4m) – same reasons as below. Playing in a stronger Man Utd team who have Champions League football and good fixtures to start. Baines (Everton – 3.5m) – despite a tricky start in the Premier League, Everton have additional Europa League fixtures in August. Without Pickford I wanted some Everton representation for these games. Baines looks a good option at 3.5m. I’m only likely to keep him to squeeze the most out of the additional games. As a result I’m likely to transfer him out after game week 2. Matip (Liverpool – 3.5m) – same reasons as below. Pretty much only for the additional Champions League qualifiers. I’ll look at potentially swapping him after these games depending on how Liverpool start the season. Ogbonna (West Ham – 1.5m) – same reasons as below. Cheap option to accommodate better (higher scoring) striking options. Also reasonably high percentage selection with other people. De Bruyne (Man City – 6m) – same reasons as below. Good coverage as a regular starter for a team in the Champions League. Also gives the chance to see selection regarding Aguero and Jesus. Mane (Liverpool – 6m) – same reasons as below. Liverpool have extra Champions League fixtures in August and Mane is sure to play a big role going forward. Salah (Liverpool – 4m) – same reasons as below. Doubling up on Liverpool for extra Champions League fixtures. Also Salah comes in at a bargain price. Lukaku (Man Utd – 6m) – same reasons as below. First name on my team sheet: bargain price, almost certain to score lots of goals and has Champions League football. Kane (Spurs – 8m) – same reasons as below. If he picks up where he left off it would be too risky not to have him. He’s also the 2nd most selected player on the game so don’t want to fall behind early on. Could be one to watch if Spurs fail to perform at Wembley. Lacazette (Arsenal – 5m) – same reasons as below. He’s the 3rd most selected striker in the game. Looks sharp and could get off to a good start at Arsenal. Potential price riser but also easily replaced with good options at 5m. To summarise, I’ve aimed for the principle of spending big on the front 6 and doubling up on players from teams with extra fixtures. I think this works well with Mane and Salah. I’ve also got the three most selected strikers in the game – spreading risk. My front 6 also all play for the top teams in the league and all have European football, 5 having Champions League. This left me a little short at the back, however I’ve still managed to get 3 defenders in who should have European football. Most importantly these 3 players are all 3.5m or above meaning I’ve got options should I want to make transfers. This meant I was left with no option but to go for Ogbonna who’s a bit of a risk but could do OK for his value if he’s a regular over the season and a cheaper option in goal. – Pickford becoming one of the highest scoring keepers over the season and exceeding Foster by 75 points or more. Aguero, traditionally the first name on my team sheet. At 7m it would take a lot of reshuffling to get him in. Alli/Pogba, as I’ve gone for Lukaku and Kane, I decided not to double up on Man Utd or Spurs. Both are selected by around 30% of other people, if they both get off to a good start I could fall behind. Jesus, looked good last season, if he hits the ground running could hit some big points early on. Morata, bargain at 5m and could be among the goals straight away. Hazard, won’t get off to a flyer because he’s injured but having no Chelsea players in my front 6 is a concern. When he’s fit again he could be difficult to accommodate at 7m. – Baines out. This is almost a certainty. Even if Everton start well I’m likely to replace Baines after game week 2. Everton won’t have any additional fixtures after this point and have a terrible run in the Premier League. I’ll be monitoring other 3.5m defenders closely such as Kompany, Kolasinac, Rudiger and Davies. – Mane/Salah out. Again after game week 2, I can’t see the value in doubling up on Liverpool midfielders. Could potentially look at Alli/Pogba. Or have a big reshuffle if I want a different striker. – On a side note. Price increases won’t come into play for the first few weeks. There could be value in transfers in some players whose price is definitely going to rise. Easy way to grow overall budget. These are only rough plans at this stage, with football things can change very quickly should a number of injuries or suspensions come into play. If anyone thinks I’ve made any glaring mistakes with team selection or has any further suggestions feel free to leave comments below. There’s still time to address any issues before kick off this evening. Clyne Out (Liverpool 3.5m), Matip In (Liverpool 3.5m) – like for like swap really. Clyne is injured and I still want some Liverpool defensive representation for the additional fixtures they have in August. Matip is available at the same price and should be certain to start. If I felt that Robinson was certain to start I’d have opted for him at 2.5m but I think it’s too risky as I want to get off to a good start. Soares Out (Southampton 3m), Martina In (Everton 2m) – I’m still not 100% sure about this one but Soares has only featured in one of Southampton’s pre season friendlies. This suggests to me he’s unlikely to be match fit for the start of the season. Southampton also won’t have the prospect of European football. As a result I’ve gone for Martina who looks likely to be cover for Coleman. Everton kept two clean sheets in recent Europa League qualifying games and have two more of these fixtures in August. He’s also 1m cheaper than Soares. This would leave me 1m in the bank. My concern is that Martina isn’t certain of the right back spot, Holgate could also be in with a shout. And of course when Coleman does return he’s likely to take this position for the rest of the season. 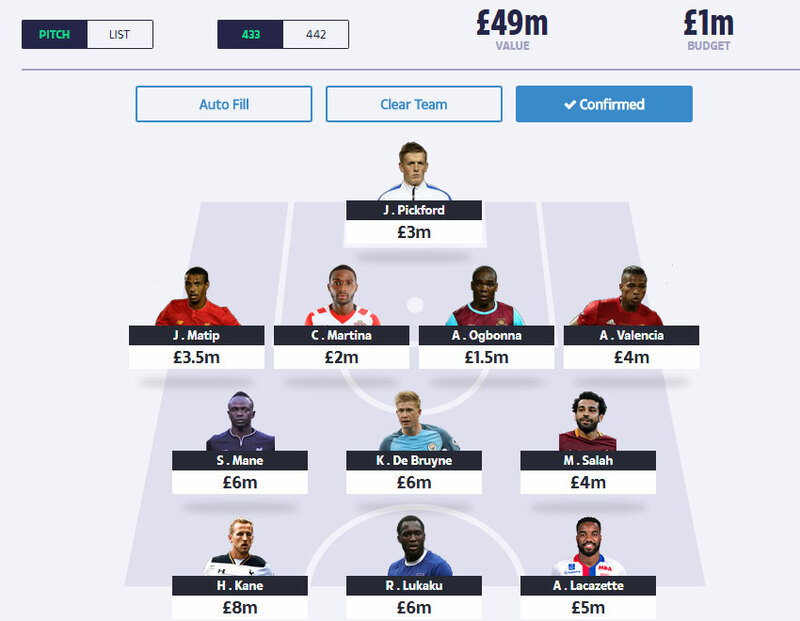 I’d be very interested in other people’s thoughts on this one as I’m really struggling with this final defensive position with 3m in the bank to spend. Coutinho Out (Liverpool 6m), Mane In (Liverpool 6m) – there’s a lot of speculation around Coutinho moving to Barcelona. This could potentially affect his selection and form regardless of the move going through or not. If he does go this would also mean an early transfer would be required – not ideal. Mane has looked sharp pre season and is an easy option in terms of a replacement. I’ve got a feeling that Mane will play in a more advanced role than Coutinho this season. I’ve also noticed there percentage selection is getting closer and closer. Mane is at 15% and Coutinho 17%. This is a trend in terms of Coutinho dropping and Mane gaining popularity. It seems a safer bet to go with Mane at this stage. Saltor Out (Brighton 2m), Soares In (Southampton 3m) – Saltor was initially selected by a lot of other managers, this has since dropped massively. Soares is proven in the Premier League and strengthens the team massively. Southampton also have a really good run of early fixtures. Pieters Out (Stoke 2m), Ogbonna In (West Ham 1.5m) – this is a risky move but the only real move available with the budget I had left. I’m hoping Ogbonna will get game time for West Ham and he could pick up a decent level of points for a very cheap defensive option. He’s also got a high percentage of other managers who have selected him. Firmino Out (Liverpool 5.5m), Lacazette In (Arsenal 5m) – I had doubts over Firmino despite the additional Champions League fixtures. Lacazette coming in at 5m was a complete game changer and he’s already the 4th most selected player in the game. I think he’s worth the risk and could well be a player who’s value rises quickly. 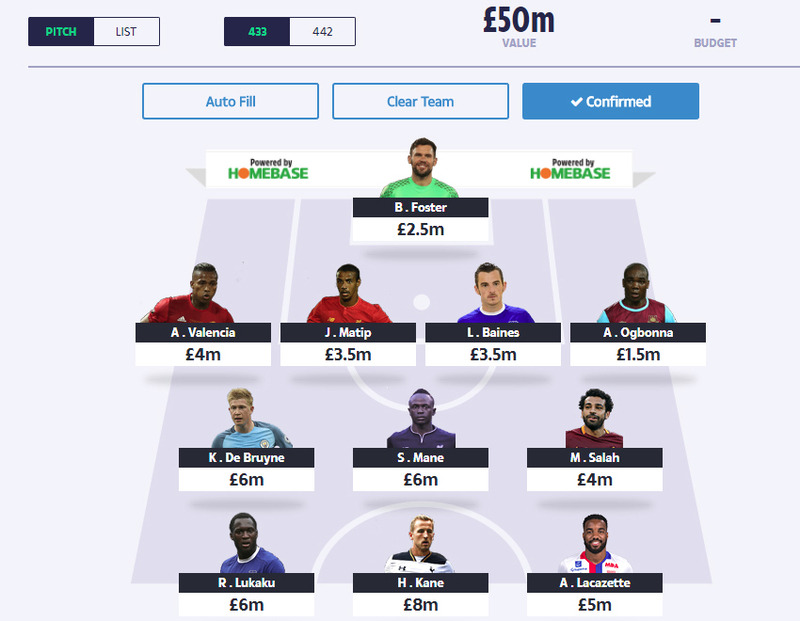 With team selection and player prices launched earlier in the week, this gave me the first opportunity to start building a team around the 50m budget. Values of premium players were much higher than I expected and there are also no real bargains as there were last year. As a result team selection has been the toughest I’ve ever seen for Dream Team. Below are my thoughts on team selection to date. This is likely to change dramatically before the start of the season, I’ve also rated each player out of 10 based on how happy I am to include them. This takes into account the player’s value, August fixtures and likelihood to score well over the season. As always please leave comments below regarding your own team selection. We can then share ideas and hopefully create the best team possible. The most important part of any Dream Team season is getting off to the best start. As a result I always plan in advance when it comes to picking my starting eleven. I’ve already started jotting down some names for a potential team for the 2017/2018 campaign. I thought it would be useful to document this process in this blog. This could become a lengthy article as I’m going to update it every time I make a decision. The blog will cover the very early stages of noting down players who did well last season, who may have potential for next season, all the way through to a fixed final team. – Players from teams with more fixtures tend to score more points. Pick players from teams competing in European competitions. – Players from teams who finish in the top 7 score more points. Pick players from these teams over players for clubs who may be in the bottom half of the table. – Strikers generally score more points than other positions. I build teams from the front, investing as much budget as possible in strikers, then midfielders, then defenders and finally a budget keeper. – Always look ahead at upcoming fixtures. Securing players who may go on a run of form against easier teams not only draws in big points but also increases the overall budget of your team should their value rise. – Chelsea, Spurs, Man City, Liverpool and Man Utd will play in the Champions League. – Arsenal and Everton will play in the Europa League. – Liverpool and Everton both face a qualification game at the start of the season for their European slots. It’s worth including players from both teams to make the most of these additional early fixtures. At this stage, no player values have been released. As a result this list is likely to change significantly before the start of the season. I’m rarely left with much budget for a keeper, I’m only considering ones who may be available at a good price. 1st choice: Pickford (Everton) – will hopefully be the cheapest out of all the keepers in Europe. The additional qualification games make him an obvious choice. 2nd choice: Forster (Southampton) – always scores well but could be a little pricey. Again I’m trying to be realistic about defenders who may be available at a reasonable price. I’ll generally overlook the premium defenders. 1st choice: Clyne (Liverpool) – almost hit the 100 point mark last season and played the most games out of any Liverpool defender. Purely first choice due to Liverpool’s Champions League qualification games. In practice this could be any Liverpool defender. 2nd choice: Williams (Everton) – scored very well last season. Also has qualification games for Europe. Again could be a cheaper Everton defender. 3rd choice: Bailly (Man Utd) – should be a regular at Old Trafford and was reasonably valued last season. 4th choice: Monreal/Bellerin (Arsenal) – both scored over 100 points last season and could be cheaper with no Champions League. 5th choice: Azpilicueta (Chelsea) – highest scoring defender last season and was relatively cheap at the end of the season. Price is likely to be hiked up. 6th choice: Yoshida (Southampton) – good last campaign. Could be a good price. 7th choice: Keane (Burnley) – may be a good budget option. 1st choice: Coutinho/Mane (Liverpool) – important for Champions League qualifiers. 2nd choice: Hazard (Chelsea) – highest scoring midfielder last season and now has additional Champions League games. 3rd choice: Alli/Eriksen (Spurs) – a case could be made for both players. 4th choice: De Bruyne (Man City) – ended the season at a reasonable price and consistently scores well. 1st choice: Lukaku (Everton) – should he remain at Everton and also start in the Europa League qualifiers. 2nd choice: Firmino (Liverpool) – only for the Champions League qualifiers. 3rd choice: Kane (Spurs) – consistently scores goals which leads to a high return of points. 4th choice: Aguero (Man City) – if he remain in favour at Man City he will always score well. 5th choice: Sanchez (Arsenal) – doubts about his future at the club but it’s impossible to overlook the highest scoring player of last season. I only discovered your website today and really do wish I’d found it 12 months ago. So far I have read your posts from Aug to Jan and they are exceptional. I’m certainly looking forward to reading the rest to see how your 2016-17 season ended. Thank you for the kind words – delighted you find the blog useful and really appreciate the contribution. Hopefully the blog will be even better for next season. Cannot wait to follow your progress this coming season !! 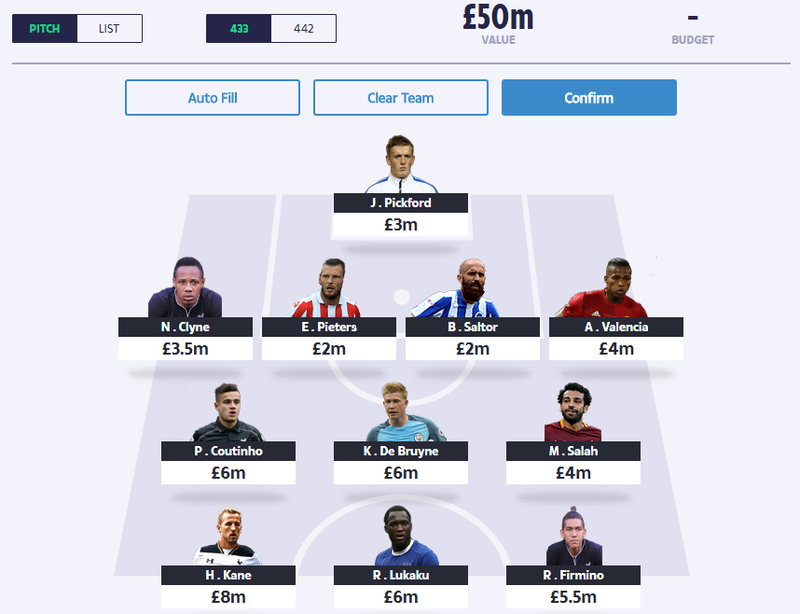 Hopefully enter your team into my works dreamteam mini league and scoop first prize…..i take it all your transfer activity will be cascaded on your blog prior to all kick offs and deadlines ? Will make a kind donation later this evening ….looking forward to the new season with greater intrest all the more now ! Thanks for your comment. I do plan to document the whole process. Really looking forward to next season and hoping to replicate the success. Be interested in hearing everyone else’s thoughts on team selection to help with making the best decisions. I’m not one for copying anyone else’s team but I will certainly be following your blogs and getting an idea from your selection process. I have been playing dream for years and I know how to play the game, last season I played well and probably only bad transfer choices early in the season kept me from winning my mini league. Roll on this season. I’m well up for it. Think it’s a great idea to have a selection process in mind but a lot of it comes down to luck as well. Player prices should be released this time next week so we can look at putting teams together then. I’m glad you’re not one for copying teams – I’m hoping the blog can become a forum for discussion around other people’s own ideas as well as my own. This way we can share info and hopefully I’ll pick up some useful insights as well. Liking your first attempt. However, question: Are CL & Europa qualifiers eligible? I didn’t think that they counted towards scoring. I’m going on the assumption that they are eligible – they always have been in previous years and they take place after 12th August. It’s my main reason for favouring Liverpool players in my initial team. Yeah he’s looking like a must have player if the transfer goes through. 6m would be a bargain compared to some of the player values and Man Utd do have a favourable start to the season in terms of fixtures. Picking up on your other comments above, I did initially have Williams but I felt that over the course of the season Valencia should score more. I try not to change my back line too much as I prefer to save my transfers. I’m hoping Pickford will be enough Everton representation defensively and they do have a very tough start in the Premier League. hi their, i wasn’t aware that the player’s prices were out yet, i thought the earliest was saturday the 8th, like some of your picks on ur first draft, starting doing ur home-work early, cld be essential, as you say getting off to a good start is key. Hi Dave, they’ve only been out for a couple of days. Any thoughts on your own team selection yet? have a look over week-end, but do like ur liverpool involvement especially in august, not sure on ur 2 weaker defenders, cresswell and soares are reasonably priced, saleh is a good price agreed, but is he a certain starter. Yeah I’m not so sure on them either but I needed two defenders at 2m each. Thought Saltor was a decent price for a club captain but have no idea how Brighton will perform in the Premier League. If Pieters plays every week he should get a decent level of points at Stoke. I’m not overly sure about Salah either but at 4m and with Liverpool’s extra fixtures I thought it was worth the risk. Especially with 3 transfers in hand for August. Not a bad team, but your defence is quite weak & Firmino has been hit or miss, but you indicate taking him out, with nothing in the bank. Not always the wisest thing to do. What’s your record at Dreamteam, where did you finish last year ? Firmino is purely for the Champions League qualifiers. I think he could easily be replaced within budget – there’s effectively 6 transfers before the end of September. Jesus and Lacazette both come in cheaper than Firmino if I wanted to do a straight swap. I came 467th last year – which I was delighted with as it was the first season I’d really done my research, how did you get on last time around? Oh I do love this banter. And I’m awaiting Anthony’s response. Sorry, haven’t been on website. Can’t remember exact finish, but it was around 3.900. I was wondering do you also have a blog running for the premier league official fantasy league ? And if so could you please forward me where i could find this ? Unfortunately not – at the moment I only play the Dream Team game. How about Sturridge instead of firmino? I think either way they would have to be transferred out quickly after the Champions League qualifiers. Firmino is surely more likely to get game time than Sturridge? Hi Mark – looks a strong team to me. The only issue I can see is no Harry Kane? I guess budget is an issue but I’d probably favour him over Jesus. Is Rooney worth a buy? Or will he not score enough points as a striker should??? Hi Lewis – I must admit I was tempted by Rooney, he’s a bargain price. However I’d imagine he will play in the number 10 role. Despite Everton having Europa League fixtures, I still can’t see him scoring enough points over the season. Equally it could go completely the other way. It’s just a bit too much of a risk for me. I was looking at Holgate as well instead of Saltor. I believe Everton have also signed Martina who used to be at Southampton. They could compete for the right back position while Coleman is out. At this stage I’m not sure which one of them will start. Have to agree,i feel the front 3 striker picks need to be hitting in the region of 300 pts…rooney wont be anywhere near that…..although a lot cheaper than the big hitting strikers…..the ratio between a top defender and average wont be as wide points wise in my opinion..
hi their, just seen ur 2nd draft team, looks stronger, is it just a fifty fifty call on jesus or lacazette, and in place of de-bruyne, and ogbonna, wld holding and sane/mkhtarian be a stronger option, bernado silva also comes highly recommended. Hi Dave, I was also looking at Jesus but I felt that Lacazette is more likely to start than Jesus. I’m waiting to see how things pan out at City to see who is likely to be their main striker. I also agree the other midfielders do look like good buys both at 4.5m but De Bruyne has a proven record of scoring well in Dream Team and should be a certain start for City so thought I’d go for the safe option. I’d also been considering Holgate but do you think he will start ahead of Martina? It looks like it could be 50/50 between them for the right back place while Coleman is out. not sure about holgate, as they have purchased martina aswell, also having a defender and a keeper in the same team in ur back five, doesn’t always pay-off, and as u say they have a tough start in the league, is kompany up for consideration good price but injury issues and his best day’s cld b behind him, they have strengthened at the back, with presumably a better keeper. Yeah I see a lot of people going for Kompany but for me there are better options available for 3.5m. I really don’t like having to waste transfers on defenders and he could pick up an early injury. I can also imagine he will be rested quite a lot. It could easily go the other way though – could end up injury free and racking up a huge number of points. For me it’s too much of a risk. hi their, waiting with interest 2 c further blogs, and ur 3rd draft team, looking at arsenal and chelsea fixtures in august, the former stoke, liverpool away, leicester home, pretty tough, the latter, spurs, arsenal away, burnley home, tougher, moratta and lacazette, tough fixtures, consideration to jesus, sane, and mkhtarian, also man-city wing-backs, demands attention. Hi Dave, I’m fairly happy with De Bruyne for my Man City representation – at the moment he seems like the only sure starter. It would be good to get some representation for them at the back but their defenders are quite pricey. I agree both Chelsea and Arsenal have tricky starts but I think Arsenal’s is slightly easier. I’m hoping Lacazette will hit the ground running. Did you have any ideas for further blogs you would like to see before the start of the season? U seem to have all angles covered, enjoy ur analysis and pre-season research, looking to c what ur eventual starting 11 will b. West brom have a easier start than everton so could maybe get pickford later ? With the europa as well i am not sure pickford will play. Yeah I agree – but I generally don’t like to waste transfers on keepers. I think Pickford should pick up more points over the course of the season than Foster so was hoping to ride the early bad fixtures out for Everton. I also had Foster last season and I didn’t think he picked up as many points as he should have based on West Brom’s position in the league. Pickford is also the most selected keeper, if he did get off to a really good start it would mean falling behind quite a few other managers. I think Pickford is a safe bet at this stage and a decent price at 3m. Point taken,ive been in a position many times over the past couple of seasons swapping keepers and defenders about for next to nothing….i like your thinking long term over the season ,and can see keeping transfers when required working out long term over the season…. Coutinho or Mane??? I cant decide on this one because Mane got 149 points in 29 games but Coutinho got 201 points in 36 games…… And last season Manes form was unreal. Klopp played Mane as part of a front 3. I was just interested to why you picked Coutinho over Mane. Soares , Zabaleta or Fonte??? It looks like west ham are improving their defence but i dont know who would perform better or play more . Fonte or Zabaleta??? Also im quite tempted by Soares. I need help!! I’ve personally gone for Coutinho purely because Mane is recovering from injury and Coutinho scored slightly more points per game than Mane last season. I do agree that Mane could play slightly more advanced though. But Coutinho is selected by 20% of other people and Mane only 11%. For the defender I’ve gone Soares. Purely because I see Southampton as a more stable team defensively and they have a really good start in terms of fixtures. It is a bit of a concern. They also lost Fonte but seemed to play well without them towards the end of last season. They should still finish in the top half of the table. So based on the pre season so far this is what I have, what do you think. Really solid team, probably one of the best I’ve seen. I’d personally favour Coutinho over Mane for the same price. I’m assuming you will look to get some form of Man City/Chelsea representation in midfielder or attack after August? With Barcelona making a bid for cout I expect him to leave when it comes in. I think he will stay personally but if he does leave. It would be a straight swap for me. If Mane is fit enough to start the season he would come straight in. Is this your final team??? Also i see you have picked Clyne over Matip… Matip has significantly higher points per game then Clyne and Matip got more points last season. They are also the same price. Out of interest why did you choose Clyne??? As i am also stuck between the two.? I think the author likes players likely to start and with a good chance of seeing the majority of the mins through. There are less options in terms of replacing clyne where as matip is easier to sub out. I felt the same way with the Valencia signing, too low points per game for my liking. It’s my final team at the moment but there’s so much up in the air. Morata coming in today at 5m could be a game changer – Chelsea being the champions and in the Champions League, it’s an absolute bargain and would free up funds if he replaced Kane. Tech hit the nail on the head really. I felt that Clyne had less competition than Matip and is more likely to feature for the duration of the season. Just wanted to post my current draft team, your thoughts would be appreciated. Hi Marc, Looks a strong team. The only player I’d question is Aguero. I’ve avoided him as I’m not sure who will be the main man up front for city next season. This could make room for Kane who is selected by 47% of other people at the moment whereas Aguero is only at 20%. Should Kane get off to a good start that’s a lot of people who could get a lead on you. Having said that I’m considering going for a front three of Lukaku, Lacazette and Morata to free up some budget for the rest of the team. Also do the europa and champions league qualifying matches count? Hi Marc, it’s my understanding that they do count. That’s why I’ve got for a number of Liverpool players. I thought the official first point scoring is Gw1 which is the premier league starting fixtures? That is the official first point scoring week but the qualifiers are after this week. On their website it says “ELIGIBLE MATCH means a football fixture commencing on or after 12 August 2017 and continuing throughout the Season” these qualifying fixtures are certainly after this date and they have counted in the previous seasons. If you don’t start scoring points till the 12th of August that would mean you miss Arsenals first game being played on the Friday 11th. One less game for Lacazette. I will be having Aguero because I can’t remember the last time you’ve been able to win mini leagues etc without him. Given there first run of games I don’t understand how you could leave him out? Potential hatrick on the opening day against Brighton. He will be the main man there still I would of thought. Nice team though pal, I am avoiding Pickford too given Everton’s run of games and so many new signings. Hi Dean, that’s a very good point. I’ve asked the guys at Dream Team about Arsenal’s game. I can’t imagine that they would exclude this fixture, but their website does currently state 12th August. If they aren’t including this game, I’m likely to take Lacazette out. With regards to Aguero, I agree he’s likely to be the main man but I’m not 100% sure. I’d rather go with someone who’s a certain starter. Also Aguero is only selected by 20% of other people, making him the 5th most selected striker. If the other more popular strikers get off to a better start this instantly puts you behind. I’m a little bit split over Pickford, I think over the course of the season he will score the highest out of the 3m or below goalkeepers. But I agree he’s got a very difficult start however I really don’t like transferring my keeper at all as they score so low. So I’m hoping to stick with Pickford for the duration. I’ve just checked with the guys at Dream Team and Arsenal’s fixture WILL count. If Evertons first qualifier match starts on the 27/7 will this fixture count? Therefore Arsenal’s game should still count. Hi Marc, it’s a little complicated in terms of the Europa League. I don’t think the round you’re referring to counts – there’s a playoff round on 17th and 24th August which will count should Everton get through. I’ve also had confirmation that Arsenal’s fixture will be counted. Thanks for checking, the way they worded the scoring part made it seem that you would miss the opening game. Gives me another thing to think about! What’s your opinion on Southampton forwards? I currently have aguero, Kane and Lukaku but midfield looks a bit bare. I may have to switch one to free up funds, maybe gabbiadini or Austin as their first games look favourable. What do you think? Or I could stick with lukaku and maybe have a gamble on tadic if he starts on the 12th. I think some Southampton coverage at the back for those easier fixtures would be a good idea. However personally I’m not really looking at them going forward. The top scoring players last season were pretty much made up from players from the top seven clubs in the league as they finished. Even with a run of easier games I still can’t see any of their strikers racking up as many points as say Lukaku or even someone like Firmino who has the Champions League qualifying games. Also I like to go for players who have a high percentage selection – this spreads the risk of other people getting a big lead over you. Charlie Austin is looking like a real bargain at the moment, seems to be the preferred starting striker and an absolute steal for 2.5m, he’s bound to be worth more after the run of easy fixtures. Jesus is also a good option with him seeming to play every game he is fit for, 5m is a tasty asking price. Arsenal striker not looking so hot with Sanchez departing and this being his first year in the pl, morata looks better. West ham I may well be crazy look decent this year with lanzini and Hernandez tasty options. De gea quit possibly a rotation risk going by what the manager has said. William looking good pre season and likely to play with hazard out. I already have Willian in because of that, looks a good shout. Blind looks a sure thing as shaw and Rojo both out until at least Sept and Dec for Rojo. I might have a punt with Austin then for something different, thanks pal. What do you think of this for a pick and stick league? I’m not keen on doubling up on Everton/Liverpool defence but it’s the only way I could get sure starters in European competitions and let’s me get 10/11 from top 6 sides. Herrera is there to balance the budget and hopefully good for 100 points. Williams or Baines (or Rudiger if you think he’ll start)? Morata or Jesus or Lacazette? Hi Charlie, thanks for the comment – I’m assuming a pick and stick league means you have the same team for the duration of the season? If so, I’d probably try and balance out your back line with some variation across the top teams in the Premier League. Other than that it looks pretty solid if it is for the duration. Thanks – I’m sure it will change several times before the start of the season. With so many options this year it’s proving much more difficult. hi their, i’ve come up with a starting 11, strong front six, perhaps weaknesses in defence, imperative to get off to a good start. Valencia choosing a wld mean no kane in starting 11, many thanx. Looks a great team. Good coverage of Liverpool players for those early fixtures. I’d opt for the team with Kane in – I think him and Lukaku would be very risky to exclude at this stage with both being so highly selected. both teams wld also have lukaku in aswell,if that changes ur verdict, but perhaps team with kane edges it, if the front 3 start firing early, it cld pay dividends, i’ve noticed west brom have nyom in their defence he has been playing in pre-season, if he’s a regular, he cld b an alternative to ogbonna their opening fixtures r possible clean sheets. That’s a valid point darren on pickford noticed he didn’t make the starting 11 last nite, keep an eye on that, and tough league fixtures in august, which keepers wld b of interest, foster, good fixtures in august, had him last season, poor return under 60pts, maybe short-term, begovic good keeper and cheap, Van dijk will go, if wimmer replaced him, a million save on soares as you say, cld upgrade ogbonna, weakness in my defence. Yeah I think there will definitely be some movement of players towards the start of the season so always worth keeping an eye out for a bargain, especially at the back. Aguero used to be the first name on my team sheet, I think at this stage his position is secure but that could quickly change. I’m likely to make a move for him or Jesus depending on how August pans out. Then upgrade wesh ham defender with martino of everton so have coverage and may play in europa unlike pickford……. With a weakend back 4 however ! like ur thought process of upgrading west ham defender to martina or holgate, that’s assuming everton get thru, only lead by 1 nill, have the same front 6 as urself, only have willian instead of debruyne, defence not to shabby, valencia, ogbonna, majip, soares, wanted trippier but not enough funds, i agree on getting hazard in asap, according to physio room due back middle september approx. I did have Firminio but that would mean picking Ogbanna at the back, which I cannot justify, WHU first 3 fixtures are away from home ? Who have you got at the back? Think you’ve spent exactly the same as me on your front 6.
hi their, is it essential to have a man utd defender, blind, lindelof, and valencia r 4 million, i know u have selected the latter, is he still ur best pick out of those three, trippier is also 4 million, and for an extra half million is it worth a punt on kalasonic above soares, wenger has been praising him pre-season. Man Utd have a much easier start and have strengthened a lot. I think Valencia is the only certain starter at the moment and he scored well last year without being classified as a defender. Kolasinac would be a good option but it would only leave me 1m for my final defender so it’s a tricky choice. Yeh probably Matip. I’m still not 100% convinced about Jesus starting? I’m not convinced he will either to be honest, that’s why I’ve gone for Lacazette. Going to wait and see how things pan out at Man City during August. Herrera did well last season but I’d be drawn to having some Liverpool representation – they do have those extra Champions League qualifiers. As a result I’d personally go for the second team. What’s everyone’s team now then??? Aguerro, he must of had assurances from guardiola, that he is going to play, otherwise he wld of asked 4 transfer, how about urself. Can I ask why you’ve gone for Ogbonna, I’m seeing him in a lot of teams, but I’ve not been tempted ? If soares is fit to play, that wld leave me 2 million for a defender, other than martina or holgate, who i wouldn’t look at till september onwards, league fixtures alone tough, who else is their, open to suggestions. I’d agree – that’s why I’ve gone for him as well. And a lot of other people have selected him as well. He’s up at around 9% selected. The fact he is being picked by many makes me tempted, but WHU have 3 away games in August and 0 home games? What do u c as best option, ur also right about coutinho, his form cld b effected, straight swap for mane. I try not to change my defenders once the season has started, agree West Ham do have a tricky start with 3 away fixtures. Soares and Pieters could be a good option as I’d imagine Stoke being stronger than West Ham. Everton look good for the next leg of the qualifying round. Two clean sheets in the previous round. However I noticed Martina didn’t start and neither did Holgate. Martina looks more likely to play at this stage but I don’t think either are certain to. Soares is also great value which is why I’ve gone for him but he’s not featured much in Southampton’s preseason games. This is making me question his place in my team at the moment. Pickford has been selected tonight now he’s fit and ready, can we see him play every game for Everton this season? I’m also thinking Mane for Coutinho. I noticed Pickford starting as well. I think he’s the best goalkeeping option for 3m or under. I wouldn’t pay anymore than 3m for a keeper and I think over the course of the season he will score the most points around that price range. Mane for Coutinho could be a good move – I’m considering the same, don’t think the rumours around a transfer away from Anfield will do any favours for Coutinho in teams of form or early selection in the season. That’s an interesting theory on getting a 3 pronged liverpool midfield, do u get 3 transfers for a short month in August, then a further 3 in september, and with possible price hikes for that trio, ur plans 4 getting de bruyne and hazard in looks possible, dropping 2 liverpool mids, de bruyne looks like getting most game-time out of man-city big hitters, although jesus is a viable swap for lacca, not sure about martina maybe september onwards, whereas u have martina and soares, i mite go kalasonic and ogbonna, but that team cld have a great start. COURTOIS – Too expensive for a keeper, I’d look for a cheaper option to save some budget. BLIND – Good choice but quite expensive, could be a rotation risk. MATIP – Keep, good to have Liverpool coverage for early Champions League qualifiers. KOMPANY – Risky based on his cost. Might be rotated or get injured. Ogbonna because he’s so cheap. COURTINHO – Keep, if he stays at the club. Mane good replacement if Coutinho goes. M.PHILLIPS – Won’t score enough points, should upgrade. LUKAKU – Keep, must have. D.GAYLE – Won’t score enough points, should upgrade. KANE – Keep, must have. I’d personally look at save some budget at the back and upgrade Phillips and Gayle. Out of the top 6 clubs in the Premier League you’ve only got coverage of Man Utd, Liverpool and Spurs in your front 6. I’d consider getting a Man City and/or Arsenal player in there as well. Should either of these teams get off to a good start you may fall behind. I try to spread the risk by having a high point scorer from each of the top 6 teams in my front 6. Which ever way I work this the third striker is suspect either through rotation risk or lack of experience in the pl. Considering this I have been toying with the idea of going 4-4-2 and picking up an extra premium mid. Looks decent with kane and lukaku up front and leaves me an extra half a million. What do you guys think of this idea. I am moving towards this idea too, and for similar reasons, I want to see how the £5M forwards get on before I pick them. If I could guarantee Aguero starting I’d have him up front too, but yes 4-4-2 is looking best right now. I like the idea of going 4 4 2 and having some key midfielders in place. However with Lacazette selected by 27% of people at the moment it could be risky to exclude him. I’ve traditionally stayed away from 4 4 2 purely because strikers score more points on average. It’s important to get off to a good start so I think it could be worth taking a risk on one of the strikers around 5m – Lacazette, Jesus, Morata or even Firmino for those extra fixtures in August. It’s in the stats centre on the desktop version of the website – really useful place when picking a starting line up. On your transfers will you blog prior to game kick offs ? Seeing jesus play the last couple of pre seasons has any body got any thoughts do they think he’s a better option than lac of arsenal right now ? I will do my best to post any transfers before kick off – last season I did a few minutes before kick off but I always post who I am likely to transfer in. I always put it on Twitter before I make the transfer. If Jesus was certain to start every game I think he would be a better option – however I opted for De Bruyne for Man City representation as I think he’s the only certain starter. I’m purely going for Lacazette to get a balanced team with some Arsenal representation. I for one cant wait till next friday when the action begins !!! I wish everyone of u good luck for the coming dreamteam season and may the luck be with you and the points flow ! You beat me to it. Was just about to post the link. I try to keep Twitter up to date as much as possible with any changes I make on a real time basis. Danny rose cld b out for further month, Ben davies cld b an option, Coutinho’s place is also in jeopardy, cld be bold and select mane saleh and firmino. How’s the rest of your team looking? I’m assuming all options include Lukaku and Kane up front as well? I’d probably go for option two as I’m drawn into having Mane. I’ll probably take out Coutinho in favour of Mane before next weekend. Option 2, was leaning towards that, jesus his adaptability should secure his place in man city team, team does include lakaku and kane, mite opt for kalasinic above yoshida, looks a bit of a hothead but scored 2day. After Arsenal play leicester on friday nite, can u make changes to ur team 4 the weekend-end games, obviously not toching any arsenal or leicester players u may have. I think you would be able to make changes but they would be classed as transfers. Over the full season would you expect Matip or Kolasinac to score more? Can’t decide which to go for! Hi Jon, I don’t know too much about Kolasinac but I noticed he didn’t start today. It also depends on how seriously Arsenal take the Europa League – if Kolasinac was to play in the league and Europa League I’d favour him, however at this stage I’m not sure he will. Matip is likely to be first choice at Liverpool. Given that Liverpool have extra qualifiers in August I’d be tempted to go for Matip to start at least. Make sense or too bigger risk ? I’ve been tempted to go a Liverpool defender, 2 midfielders and a striker. If they do well in August it could result in a big head start. Having said that if it goes the other way and they flop it could put you quite far behind. I’ve decided to go for a defender and two midfielders. I don’t think I’d risk having all 3 midfielders as Liverpool players. what do u think of redmond?? especially with southamptons easier games to start with. Southampton certainly have a good start but I wouldn’t personally be looking at him as an option. I wouldn’t put in any midfielders or strikers from outside of the top 6 teams in the Premier League as they finished last season. There are so many good options that I wouldn’t want to leave out the likes of Mane, De Bruyne, Pogba, Coutinho or Alli over Redmond. looking at ur latest draft, i agree with tech, wouldn’t double up on everton back five just yet, in the 2nd leg of europa league pretty sure koeman played 3 at the back, williams, keane and baines, u seem keen to keep ogbonna so a wba defender or holding at 3 million, he played in charity shield. I’m not overly keen on Ogbonna either to be honest but I’m certain I want the front 6 that I’ve got. It’s proving difficult to pinch any budget from anywhere to spend on defenders. I’ve gone foster in goal to save half a million, pickford september onwards, crystal palace defence is affordable, ward, dan, and new signing riedewald, good fixtures in august, alot tougher in September. I’ll have a think about it between now and Friday. It does look like the general consensus is that Martina might not be the best option. I was torn over including him anyway so may look to address this. hi their, looking at ur back five issues, majip, valencia keepers, followed by. Foster, good fixtures in august, change to pickford, September onwards. Stephens, cheaper option back 4 southampton. Dawson, van aanholt, c. Daniels if you want 0.5 in the bank. Lots of people have mee but I’m not sold on him. Yeah it’s a good point. Think I will review my options regarding Martina before Friday. I’ve gone quite cheap on defence, but my team is quite evenly spread, ive gone for evans at the back for 2.5m as west brom have quite easy fixtures at the start and he is the new captain this year. I’ve doubled up on man united defenders because of their easy fixture list and they tend to be very solid at the back. Looks good to me – not too dissimilar to the team I’ve gone for. Good Liverpool coverage for those early fixtures and I’m guessing you’ve avoided Everton players because of their tricky start. What about Alexander-Arnold for Liverpool? Added and is 2.5mil could potentially keep Clyne out. That gives me more confidence in Ogbonna so I think I will stick with him for now. Will also look to review Martina before Friday. I think I’m happy with this setup atm. Looks like a strong starting team to me. So I have been thinking about strikers. I would say both Hernandez and Rooney score 15 goals this season. For lukaku to be twice Romney’s price will he deliver twice his goal tally? I doubt it. Good value but I want my strikers scoring 300+ points over the course of the season. I’d personally never look any further than teams in the Champions League as well. Any thoughts on Gabbiadini? Expect him to score a lot of goals in the first 3 months of the season. Saints Fixtures up until the end of Oct. Swansea, West Ham, Huddersfield, Watford, Palace, Man Utd, Stoke, Newcastle, WBA, Brighton. It wouldn’t surprise me if his goal ratio was close to 1 a game with that run of games… Throw in a couple of League Cup games as well…. He looked good last season and they do have good fixtures to start. Personally I can’t get away from Lukaku, Kane and one other from one of the top 6 teams. I just feel like they will run away with it in terms of points. Other than Benteke all of the top 10 strikers in terms of points from last season were from teams within the top 7 clubs in the league. I wouldn’t bet against them being in the top 7 at the end of October… I do agree with you, but think he could be the one dark horse whose value will sky rocket. Perfect for Transfers in a few months time! They could well be, I tend not to take too many risks and aim for strikers from the top teams, who will play on a regular basis, have a proven track record of scoring points and are selected by a lot of other people. I personally wouldn’t take a risk on anyone who doesn’t fit in that bracket. I’ve gone quite cheap on the defence, to free up some room for aguero as I’m not too keen on lacazette at this stage. I could avoid pickford and put de gea in goal and replace Valencia with Holding, do you think this would be a better choice, avoiding everton opening fixtures. If you had the choice between any striker for the third striker who would it be, im torn between Firmino, Lacazette and Aguero at the moment. Looks a good team. I’m struggling with my third striker as well. I’ve gone for Lacazette at the moment because he’s the third most selected striker and wanted some Arsenal representation. I think Firmino could be a good option based on Liverpool’s Champions League qualifiers and who could ever rule out Aguero. It’s proving very difficult this season. I’d been looking at Arnold as well but do you think he will play much when Clyne returns? I believe Clyne won’t be out for too long either. I agree with most of your selection. Martina seems to be the one with the question mark next to him. I’m not sure who will be first choice – Martina or Holgate while they cover for Coleman. West Brom may well be the team I look towards for this position but I’ll be sure to update my team before Friday and post the final team. I’d personally go Foster, Yoshida and Davies. I don’t like spending much on a keeper so wouldn’t be happy with De Gea. Also Yoshida is an almost certain starter. just trying to take advantage of man-utd’s easier start, plus an extra player in europe, had foster last season under 60pts, i’m assuming stephens will be a regular in southampton defence, bit sick of tinkering, so many options, still can’t c why people r favouring ogbonna, 3 away games in august how many clean sheets, very little chance of his price rising, and the use of 1 transfer straight away. I’m with you on Ogbanna, can’t see any relevance in picking him. I’ve purely gone for Ogbonna because he’s cheap and is being picked by a lot of other people meaning he’s less of a risk. I’m fixed on my front 6 which means I’ve got to cut back in defence. Why no Man City defenders, Kompany for example has been selected by 12.3% ? Budget really, ideally would upgrade ogbanna or Stephens, but what change would you do to allow that? Exactly the same problem I’m having. Not enough funds at the back to get some really top defenders in. Hennessey, 2 out of 3 good fixtures in August. Holding, possible keeper, = 7.5 million. As 4 pickfords xtra europa league fixtures, in the first qualifying round he only played 2nd leg, because of slim lead, no guarantee of playing 2nd round, September onwards yes, cheapest way in2 Everton defence. Haven’t noticed anyone mention Pieters (Stoke 2m) as a cheap defender yet, any reason? I had him in originally but wanted to strengthen up with defenders from some teams who may finish higher up in the league. Darren, have gone, Kane, Lukaku,& Jesus, i feel like de bruyne he’s almost undropable, can play wide aswell more mobile than aguerro, he’s capable of scoring as many pts as other 2, which leaves u funds 2 strengthening defence. thoughts on ozil at 5.5m? I prefer Lacazette as an option and Ozil is also unlikely to be fit for game week 1. Once fit he would probably be my second choice Arsenal player. Anybodys valuble imput would be great at this late stage @@! I’m struggling with the same position. I’m thinking possibly a West Brom defender and then Soares once he’s fully fit. Alternatively I’m thinking about a U turn on Pickford. Downgrading to a cheaper keeper and having a bit extra for my final defender to be someone like Ben Davies. With the 2 extra qualifers to get a good start then see who settles quickest from jesus lac and morata ? Almost good to go, 2 dilemmas to solve. When r u likely to post ur final decisions , on keeper and defence, advice on my dilemmas wld b welcome. I’d probably go option 1 in both cases. I’ll put my final decision up as soon as I can. It will probably be tomorrow lunch time. I think I’m nearly there with Foster, Matip, Valencia, Ogbonna, Davies, Mane, De Bruyne, Salah, Kane, Lukaku and Lacazette. all this planning pays off. Kompany, a nailed on starter when fit and I have seen stats that suggest man city are better defensively when he plays. I’m with you totally on this one. Firminio up front for Liverpool is too good to ignore. How many Liverpool players in your squad now? Fantastic start – no clean sheet for Arsenal either is a big bonus. Let’s hope for a Lacazette hat trick. Looked like the same old liverpool defence, should we look to get matip out, or stick with him 4 the extra champions league games, then get rid, maybe not panic yet, i made transfers to early in the month last season, i agree with baines and mane/saleh out after game week 2, for the players u mentioned, we don’t want aguerro scoring regularly, or a new strategy maybe needed, i went jesus who is capable of matching aguerro pts wise, patience required, this is a 10 month commitment. I’m definitely going to stick with Matip – but they were a shambles. Agree Baines should come out despite a decent start – Kompany could be great value at 3.5m if he’s looking like a regular. I may stick with Mane/Salah for the time being – they are both almost playing as strikers. Aguero and Jesus are both a worry, I know they were only playing Brighton but both could have easily grabbed a couple each last night. Is it worth a gamble, to take either of the former 2 out, to eek out an extra game for Furmino. I’m personally not going to. He not selected by that many other people so shouldn’t cause too much of an issue. I want to hold onto my transfers to make some proactive ones towards the end of the month rather than a short term gain. Firmino would only have to be taken out again in my opinion. Ok, i’ll hold back on transfers, do u envisage making transfers next thursday, after everton’s europa league game, each game week is Friday to Friday, i believe. Personally I’ll hold fire for as long as possible. I may wait until the European qualifiers are completely over before making any changes. At the moment I can’t see any changes I’d like to make. I knew picking Ogbanna was a big mistake -4 after 1 game, with 2 more away games to come. All to fit other players in, very bad tactic in my opinion. I agree with Dean, I didn’t expect much at all for Ogbonna against Man Utd at Old Trafford so it came as no real surprise. -4 points is nothing in the grand scheme of the season. If West Ham end up finishing in the top half of the table and he starts for the rest of the season then he will chip in some points. Also it’s only 0.5m to upgrade to Stephens so it could easily be changed if need be. It is only 1 game. Look at Cahill for example, costs 5.5m and on -5 points.